Valves [a.k.a. tubes] of all shapes, sizes and makes have always been associated with the many celebrated tones of Marshall amplifiers and with good reason – they’re an essential component in the creation of what has become known as the ‘Marshall sound’. Yet, despite their importance, in the mind of the average guitarist valves are shrouded in a mysterious aura. In fact, over the years a whole mythology [some of it factual, some of it pure fiction!] has been built around these enigmatic electronic components. In this, the first of a series of features on this subject, we hope to shed some light on the much misunderstood valve. We’ll start by explaining a little bit about how these glowing, glass tone-generators work – in ‘guitarist friendly’ terms of course! Born in 1904, the valve is the grand-daddy of present day electronics. By the late forties they were literally everywhere – in radios, TVs, industrial machinery, telephone systems and even the first computers. Mind you, the first computer was hardly a laptop by any stretch of the imagination – it weighed a staggering 30 tons and was the size of a large room! Then, in 1948, the cool-running and service free transistor was invented and that brought about the beginning of the end of valves in the majority of applications. In fact, by the mid-70s they’d been purged from virtually all modern-day electronic devices, except for certain, very expensive Hi-fi components and rock ‘n’ roll amps – especially the Marshall kind! The term ‘valve’ is purely the shortened form of ‘thermionic valve’ Now, although we Brits call ’em valves, our transatlantic cousins in America prefer to call ’em ‘tubes’. And, as it so happens, ‘tube’ is merely the shortened form of ‘electron tube’. Funnily enough, adding the two names together actually gives a pretty apt description of how these things work -namely, a Valve controlling Electrons flowing in a glass Tube due to Thermionic [heat] action! The simplest form of valve is called a diode, a word derived from ‘dielectrode’ which simply means ‘two active elements’ [di is the Greek for two]. These two ‘active elements’ are called the cathode and the plate [a.k.a. anode] and they are placed inside a sealed glass enclosure with all the air removed from it, creating a vacuum. Right next to the cathode is a heater [a.k.a. filament], which literally works like a tiny electric fire. The job of the heater is, believe it or not, to heat up the cathode! When the cathode is heated up to its working temperature y’see, it emits a steady cloud of electrons – don’t expect to see this ‘cloud’ when you look at a working valve though, electrons are so tiny they’re invisible to the human eye. Now, as you may remember from science class at school, electricity is made up of electrons and when electrons move from one place to another, they create a current. Also, electrons have a negative charge and electric current always moves from negative to positive and never vice-versa. So, the next obvious question is: what happens to the cloud of electrons the cathode is emitting inside our diode? Read on . . .
A high voltage is connected to the plate [our second ‘active element}, remember?] which, incidentally, is made of a type of metal which won’t emit electrons at its normal operating temperature. As I’m sure you know, the alternating current [AC] you get from the mains supply in the wall your house is so called because it alternates between positive [+ive] and negative [-ive]. It does this 50 times a second or Hertz [Hz] in most places in the world, including England, 60 Hz in America. Anyway, as a result of the AC supply it is attached to, the plate is continually alternating from +ive to -ive. So, whenever the plate is +ive, the cloud of electrons floating around the cathode are attracted to it and a current flows. When the plate is -ive though, the electrons stay where they are: as the sub-head reminds us, opposites attract! This means that the current within the valve is only flowing in one direction: this is called direct current [DC]. So, what our diode is doing is converting AC into DC. Because a diode is effectively ‘rectifying’ AC into DC it is often called a half-wave rectifier. Why ‘half-wave?’ Think about it – due to the alternating current, the rectifier is ‘asleep’ half the time! The GZ34 valve found in the power supply of the Marshall JTM45 and the Vox AC30 actually houses two rectifiers which work in conjunction with the power transformer to create a greater amount of usable DC current from the AC. This type of valve is called a full-wave rectifier. As anyone who has been unlucky enough to put their hand in the back of a valve amp which has been switched on for a while will tell you, valves get extremely hot! So, always let your amp cool down before you try changing a valve – unless you enjoy pain and like the smell of burning flesh! Even more caution should be aired if you’re thinking about opening up a valve amp and doing some work on it. If you don’t know what you’re doing then Don’t. In most common designs there are between 300 and 600 volts going to the plate so beware – such voltages can and will throw you across a room and might even kill you. For this reason we always recommend you only have an experienced and qualified tech work on your amp. So, a triode is a diode with an extra electrode added – the grid [a.k.a. Control grid]. As its name suggests, the grid looks very like a wire mesh. This seemingly simple addition gave versatility to the valve because by varying the potential [voltage] connected to the grid, the flow of electrons could be increased or decreased. This, of course, gives the valve the ability to amplify a signal. The grid effectively controls the flow of electrons between the cathode and the plate in a very similar manner to turning the valve handle of a tap controls the flow of water. To be exact, the grid is charged with a -ive voltage called the bias voltage. This voltage varies up and down in a pattern that corresponds to the notes you play into the amp. As the grid voltage is made more +ive [i.e. : less -ive], it allows more and more electrons to pass through to the plate and the plate current increases. Simply put, because the relatively small grid voltage is controlling the very big plate current, your puny guitar signal is now amplified! Before long, new developments added extra parts to the triode in order to make it more efficient and also increase its power handling – enter the pentode type valves such as the EL84 and EL34, and beam pentodes, such as the 6L6 and the 5881. As ‘pent’ the Greek for five, a pentode valve has [wait for it!] five ‘active elements’. The two extra elements in an EL34 or an EL84 are screen and suppresser grids. The two extras in the 6L6 and 5881 are a screen grid and a beam forming plate [see corresponding exploded diagrams]. These types of valves are used in the output stages of amplifiers due to their extra efficiency and power. What Valve does what in an amp? 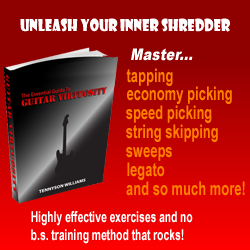 And, along the way it also shapes your guitar’s sound according to how the tone controls for bass, middle and treble are set. Most preamps will also allow the user to control the amount of gain [distortion] added. In fact, in modern amps, the amount of pre-amp gain on offer is often massive! 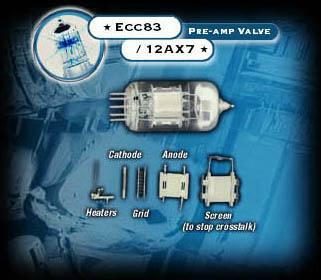 The type of valves used in all Marshall pre-amp stages is the double triode ECC83 or 12AX7 [ECC83 is the English name for this valve, 12AX7 is the American – further proof that we are two countries separated by a common language!]. As expected, double triode means there are two triode type valves lurking in one package. The reason we use ECC83s? They have great tone and offer the most gain. Obviously, it should go without saying that valves alone do not a great amp make. The real design work involves all the associated circuitry that couples all the valves together. It is only by ensuring that each stage gets the right amount of signal, in terms of both level and tonal spectrum, that the designer will achieve optimum amplifier performance. Once the pre-amp has beefed-up, shaped and [if desired] distorted your guitar’s signal, it is then fed into the power amp which gives it the required physical clout to drive the loudspeaker system. In addition to adding further muscle to your guitar’s signal, if desired the power amp of a Marshal valve amp can also be driven to the point that it also adds desirable, harmonic distortion and compression. This is [surprise, surprise] called power amp distortion! Power amp distortion creates a very open, big sound and great examples of it in action can be heard on the first few Van Halen records and just about anything by Cream or AC/DC. In the power amp section you’ll usually find two types of valve being employed. At the input you’ll find another double triode, usually an ECC83, which functions as a phase splitter or inverter. Simply put, as its name suggests, this valve’s job is to split your guitar’s signal [which presents itself as a sine wave into two halves. Why? Because the beefy valves that make up the rest of the power amp [usually EL34s, EL84s, 5881s or 6L6s] work together as pairs in what is known as push/pull operation, that’s why! The portion of the wave above the central line is dealt with by one power valve [or group of them] while the portion below is dealt with by the other valve [or valves]. Over the years, Marshall amplification have used all the power tube types just mentioned and several more besides. As you’d expect, each type has its own unique tonal characteristic. The one most associated with the Marshall sound is, of course, the almighty EL34. Having said that, one of the most famous Marshall sounds ever, was Eric Clapton’s awesome ‘woman tone’ on the legendary ‘Bluesbreaker’ album and the output valves in the 1962 ‘Bluesbreaker’ combo he was using were KT66s. It should also be noted that each type of output valve has a finite, usable power limit. This is why a 50 Watt Marshall valve amp always contains a pair of EL34s or 5881s while a 100 Watter will house a quartet. Likewise, the new DSL201, 20 Watt, 1×12 combo houses 2x EL84s, while its bigger brother, the 40 Watt DSL401, contains four of these toneful little bruisers!